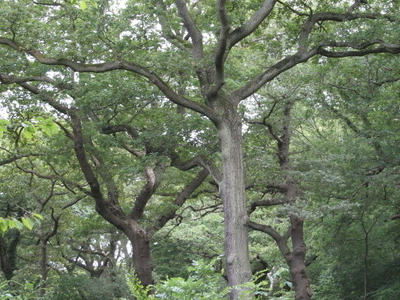 Queen's Wood is a 52 acre (21 hectare) area of ancient woodland in the London Borough of Haringey, abutting Highgate Wood and lying between East Finchley, Highgate Village, Muswell Hill and Crouch End. It was originally part of the ancient Forest of Middlesex which covered much of London, Hertfordshire and Essex and was mentioned in the Domesday Book and is now one of three Local Nature Reserves in the London Borough of Haringey. It is situated a few minutes' walk away from Highgate tube station. Haringey contains four distinct ancient woods. These are Highgate Wood, Queen's Wood, Coldfall Wood and Bluebell Wood. All are shown on John Rocque's 1754 Map of Middlesex. Queen's Wood was once called Churchyard Bottom Wood, and was originally part of the Great Forest of Middlesex. It was said to be the site of a plague pit. In 1898 it was purchased from the Ecclesiastical Commissioners by Hornsey Urban District Council, and renamed Queen's Wood in honour of Queen Victoria. Here's the our members favorite photos of "Nature Reserves in London". Upload your photo of Queen's Wood!